Some of the nation's newly minted mayors may be eager to tackle their political agendas, but a more immediate challenge calls: a big winter storm slugging their cities. As a snowstorm and frigid temperatures bore down on the Midwest and Northeast on Thursday, new mayors in New York and Detroit were given their first test of keeping city operations up and running. Boston's next mayor, who takes office Monday, will face the task of dealing with the aftermath of the storm, forecast to dump up to 18 inches of snow in his city. Hours before he was sworn in as New York City's mayor at the stroke of midnight in the new year, Bill de Blasio vowed the city would be prepared for the weather headed its way. "Something like a snowstorm I take very personally," he said. "We obviously have heard the reports, we’re going to be monitoring closely and if we see a situation that’s worsening, we’re going to take very aggressive action." At an early evening briefing, de Blasio said he had met with all his commissioners earlier in the day. De Blasio, who as public advocate in 2010 criticized his predecessor Mayor Michael Bloomberg for his handling of a post-Christmas blizzard, said hundreds of plows and salt spreaders would be on the streets as soon as the snow started falling Thursday night. "We have to get it right, no question about it," de Blasio said. "We are focused like a laser on protecting this city and getting everyone ready. We have all hands on deck." The Metropolitan Transit Authority, which runs the New York City's public transportation, activated its incident command center Thursday morning. Subway platforms were salted, and ice-breaking machines were fueled with plans to deploy them to all 468 subway stations and along all 220 miles of outdoor track. The NYC Sanitation Department will send 4,600 workers out Thursday to salt and plow streets. Thursday's snowstorm is not expected to be nearly as heavy for New York as the 2010 blizzard, which left the city's streets clogged and unplowed for days afterward, but de Blasio isn't taking any chances after that storm prompted furor and frustration directed at Mayor Michael Bloomberg for the slow clean-up effort. It wasn't the first time New Yorkers criticized their mayor after a blizzard: In 1969, a deadly storm dropped 15 inches of snow on the city, paralyzing it for three days. The debacle nearly cost then-Mayor John V. Lindsay re-election. De Blasio will have help from some storm-beaten veterans: the commissioners of the FDNY, the Office of Emergency Management, and the Department of Sanitation from Bloomberg's administration will be staying on to help with the transition for the next few months. And his seasoned deputy mayor, Tony Shorris, is overseeing the storm response. 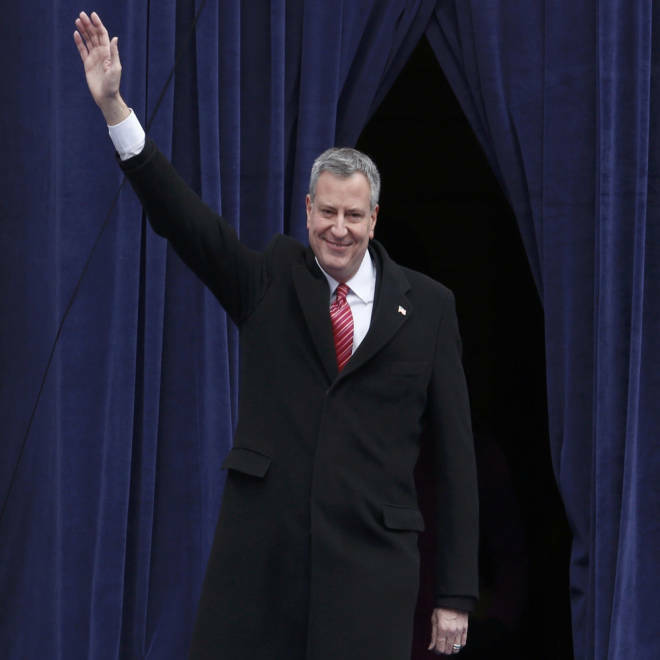 New York City Mayor Bill de Blasio arrives for his public inauguration at City Hall in New York on New Year's Day. He is one of several mayors whose first task in office will be dealing with Mother Nature's wrath. In smaller cities, such as New Haven, Conn., Toni Harp — New Haven's first new mayor in nearly two decades — was sworn in Wednesday afternoon, and immediately had to turn her attention to the weather. New Haven's schools will be dismissed early on Thursday, and parking bans were put in place to make room for plows. In Minneapolis, new mayor Betsy Hodges was being sworn in Thursday, as multiple area schools were closed for the day due to the weather. Meanwhile, in Detroit, which got several inches of snow Wednesday and was expected to receive up to 8 inches more, new mayor Mike Duggan decided his first act in office would be to hop on a plow with a city worker. Duggan, who took his oath of office in the bankrupt city on Wednesday, said he would ride the snow-covered streets on Thursday. "When you get elected to office you don't automatically have all the answers, so it's a learning process," he said. "I'm going to to go out and visit one of the yards and ask for one of the drivers to take me out in a truck. I really want to start by understanding the challenges that our workers face in clearing the snow." Several snow emergencies were declared across Metro Detroit on Wednesday night, forcing residents to move their cars off city streets until the roads had been plowed. It's the first task for a mayor with an ambitious agenda for his first 100 days, in which he plans to tackle blight, busing and lighting problems in his financially crippled city. Duggan, too, has learned from predecessors elsewhere in the Midwest that quick snow removal is crucial to a good political reputation: In 1979, Chicago Mayor Michael Bilandic's slow response to a blizzard greatly contributed to his defeat. In Boston, where the mayoral handoff from Thomas Menino to Martin J. Walsh doesn't take place until Monday, the mayor-elect has been preparing for how to deal with snow for nearly a month. On Dec. 10, Walsh and Menino conducted a mock snow-response strategy session, gathering more than a dozen heads of city departments at City Hall. The officials discussed everything from what time was best to announce school closures to imposing parking bans. The mock session will come in handy for Walsh when he is sworn in next week, after up to a foot and a half of snow hammers Boston. In the meantime, Menino made it his last official act in office to declare a snow emergency for Thursday and close Boston schools on Friday. "What a New Year's gift, to receive one last snowstorm as mayor," Menino said Wednesday.